Thanks to singers like Mariusz Kwiecień and Piotr Beczała, Poland has become synonymous with great opera. However, few people know that the music world’s fascination with Polish singers began a century earlier. In a beautiful mansion on Lake George in the state of New York, Marcella Sembrich lives on thanks to a museum entirely devoted to her extraordinary operatic career. The house is a former summer retreat and teaching studio where Sembrich taught music during the so-called Golden Age of Opera at the turn of the 19th century. This was an era when opera singers had hordes of infatuated fans, much like pop stars nowadays, and Sembrich was cherished by crowds all over Europe and America. The museum’s exhibits shed light on her extravagant stage life: luxurious costumes, medals presented to her by enamoured heads of state, and last but not least, letters from Mark Twain. The Sembrich Opera Museum also displays canvases by Jan Chełmiński and Józef Brandt, proof that the singer liked to surround herself with art from her native country. Sembrich was born Prakseda Marcelina Kochańska in partitioned Poland near Tarnopol in 1858. She came from a musically inclined family who struggled to make ends meet. Her father, a travelling music teacher, taught her how to play the violin and the piano. At 11, she started to study music at the Lviv Conservatory where she received piano lessons from Wilhelm Stengel – her future husband. She furthered her musical education in Vienna where she decided to work on her voice after being encouraged to do so by Franz Liszt. She made her debut as an opera singer in Athens in 1877 as Elvira in The Puritans by Vincenzo Bellini. A year later she already had a contract with the Dresden Court Opera. It was at this crucial point in her career that she decided to adopt her mother’s maiden name as her stage name. She had always preferred to be called Marcella rather than Marcelina or Prakseda, and she therefore began to perform under the name Marcella Sembrich. She had a vocal range of 2.5 octaves and a flute-like timbre that gave her coloratura soprano a special frailty. To this magnificent voice she applied the sensibility of a violinist, making her singing voice absolutely unique. Her artistic qualities secured her a place among the most successful opera singers of the time. After Dresden she began to perform at London’s Covent Garden Opera. She also frequently entertained audiences in Madrid, Paris and Warsaw. In Saint Petersburg she performed The Wish by Chopin before the Tsar, who was so taken with her voice that he offered her a golden bracelet with diamonds. This was nothing out of the ordinary for Sembrich, who frequently received near-priceless jewellery from European aristocrats. She would often amuse audiences by showcasing her three instruments – the violin, the piano, and the voice – in a single evening. 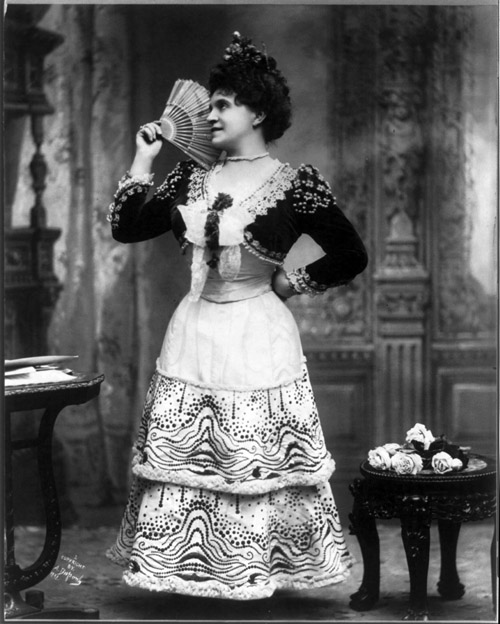 She performed at the Metropolitan Opera in New York from 1894 until the end of her singing career in 1909. Afterwards she remained active as a musician and gave concerts all over the world. After her husband’s death in 1917, she decided to leave the stage but even then, she did not retire and instead went on to teach other musicians until her death in 1935. Despite being one of the most successful opera singers of all times, and mingling with monarchs, billionaires like Andrew Carnegie and great composers like Johannes Brahms and Gustav Mahler, she never denied her humble background. There are many accounts of her unfailing kindness to street musicians. The diva also made it her mission to promote Polish art as much as possible – her concerts almost always featured a piece by a Polish composer. Author: Marek Kępa, ed: az, October 2016.